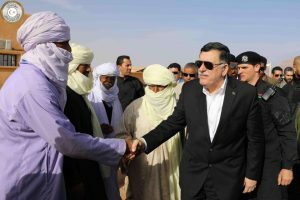 The needs of people in the south-western border town of Ghat were at the centre of discussions today when Presidency Council (PC) head Faiez Serraj accompanied by a number of acting ministers and officials made a flying visit to the town. During the trip, Serraj – along with PC member Ahmed Hamza, local government minister Bidad Gansu Massoud, social affairs minister Faida El-Shafi and Presidency Guard head Colonel Najmi Al-Nakua – toured the local hospital where the discussions were on how to re-build services. They also visited the Essien border post, on the Algerian frontier, some 17 kilometres from Ghat. There were a number of meetings too with, among others, the local municipal council and Tuareg leaders. Ghat has suffered knock-on effects from Libya’s varied conflicts during the past year and a half. Like the rest of Libya there have been power and water cuts and no money in the banks, but on top of that the hospital all but closed when most of the doctors left and fighting in Obari cut the road to Sebha, leaving the town isolated. Eleven months ago, as one of the first towns to welcome the appointment of the PC, it invited Serraj to visit the town. He has not done so till now.